N.L.P., short for Neuro Linguistic Progra‍‍‍mming, is a study of the relationship between our mind, our language and our habitual patterns of behaviour. ‍‍‍A NLP coaching program consists of a series of practical, manageable steps to release negative emotions from the past, transform the beliefs that hold you back and focus your mind to make the right decisions, to achieve your desired outcomes at a pace to suit you. 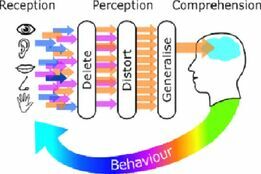 NLP influences brain behaviour through the use of language and psychology. It is a systematic approach created by well known psychologists that focuses on how we think, act, feel and process information. NLP can “recode” the way the brain responds to stimuli to help us get the results and lead the life that we desire. ‍‍‍As we go through life, experiences form our beliefs and values. We each see the world from our own, subjective, point of view. You may believe that there is only objective reality and that's that. However, if there is only one objective reality, how can two people have such different memories of the same event? ‍‍‍If someone once laughed at your first attempt at something, you might come to believe that you cannot do it. These beliefs become ingrained over the course of our lives, so that we no longer question them or are even aware of them. With NLP, I will guide you through powerful techniques that allow you to release negative emotions from the past, transform the beliefs that hold you back and focus your mind so you can become the person you were meant to be.